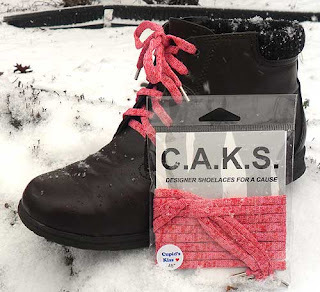 Perky up these winter days with Cupid's Kiss Shoelaces, a cheerful red/pink blend made from Kreinik threads. Robin's Egg Blue Shoelaces will get you marching into spring with their baby blue shades. Both are new colors in the C.A.K.S. line of shoelaces created by Kreinik. C.A.K.S. Laces honor Charles Austin Kreinik who took his own life at age 28. In the end, Charles was affected by physical pain, alcoholism and depression, but in brighter days he was a gifted person of quirky humor and generous spirit. You could even spot that in his clothes: he loved wearing unique, patterned socks and bowties. Suicide dimmed that light. However, Charles’ parents, Doug and Myla Kreinik, want others to keep theirs shining brightly. 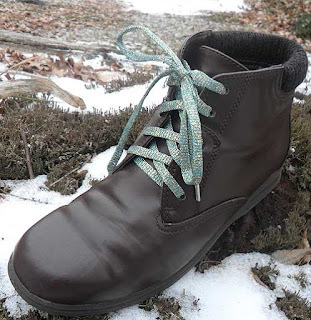 One small way to do that is through these fun shoelaces, made from Kreinik threads in West Virginia. Wear these colorful laces to brighten your corner of the world and show your sparkling personality. A portion of the proceeds from C.A.K.S. Laces will benefit a fund designated for suicide prevention, addiction counseling, and grief support programs. So lace up your shoes, put one foot in front of the other, and keep on going—or dancing! Your purchase helps others, supports grieving families, and makes the world a little brighter. Fresh and cheerful, versatile and useful: the Spring 2016 Kreinik metallic thread color additions are here! 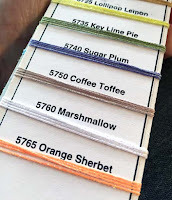 Available now in Tapestry #12 Braid size (coming soon in other sizes), meet 5801 Cool Cucumber, 5802 Leap Frog, 5803 Seaside, 5804 Calypso, and 5800 Golden Blackberry. In a metallic finish—whether in home decor, clothing, jewelry, or stitchery—you either want classic and elegant, or bright and fun. The new colors cover all of these. So how do we go about choosing new thread colors? We listen to designer and stitcher requests, plus examine the line from time to time to see what's missing. 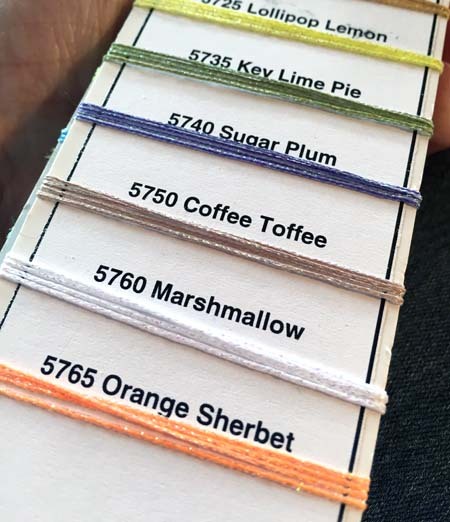 In this case, when we reorganized the Kreinik Metallic Color Card in shading order—all the greens together, all the silver shades side by side to better help you select threads for your projects)—we noticed a need for other shades. The two new green colors, for instance, work nicely into the chartreuse families. Use 5801 Cool Cucumber and 5802 Leap Frog for many designs; shades of lime are now standard for tropical, spring, floral, Halloween, and Christmas themes just to name a few. We are always asked for shades of orange, so the new 5804 Calypso was created to offer a shade less metallic than 027 Orange but still rich in color. The gold-orange variegation in the Braid gives you a little depth and light play in the color, adding a pretty glimmer of shimmer. When it debuted at the TNNA needlework trade show this month, designers were already planning on using it in autumn and Halloween themes. The new color 5800 Golden Blackberry also joins our relatively new line of gold color blends. This one features a black-blue-purple-berry. The result is as royal as you can imagine, rich and classy while almost fairy tale in appearance at the same time. We think it also makes a gorgeous night sky color too. Don't you love a thread color that works in so many designs? One of the main reasons to use a metallic thread in a needlework pattern is to replicate the metallic nature of a real-life object. Water, for example, is naturally shimmery. When you see water, snow, dew, rain etc stitched in a matte cotton or wool thread, your eye knows something is missing. Water motifs just need to be metallic, so for your stitching awesomeness, we proudly present 5803 Seaside, a blue/green/pearl mix. It has a fairy-tale quality as well, so look for places to use it in all kinds of designs. That's no typo in our headline…it is the Year of the Re, as in re-imagine, re-ignite, re-fresh, re-group, re-invent. January is always a good time to reorganize and rededicate yourself to what matters to you. Whether that means learning new needlework techniques, finishing projects, organizing your stash, teaching youngsters, or personal goals like getting fit or stopping smoking, every day gives you a chance to improve something, start anew, and be thankful. Here at Kreinik, our 2016 Quest is to journey with shops, designers, publications, makers, and stitchers to rejuvenate a love of color, texture and dimension in everything. We want to help you embellish the world, brighten your corner of it, share the love of all things creative, and have fun. We are thankful for you, our friends and customers, and can't wait to make life better for you in any way that we can. Colors in the Kreinik metallic thread line aren't static; they move with the flow of trends, moods, and seasons. Since colors have been added, discontinued, dye lots changed, we created an updated Kreinik Metallic Color Card, available now through your favorite needlework store or www.kreinik.com. This tool (which contains actual thread swatches) will keep you organized and make it easier to pick colors for your next project. Plus, if you're reading a chart and don't recognize a number, the color card will show you the color. 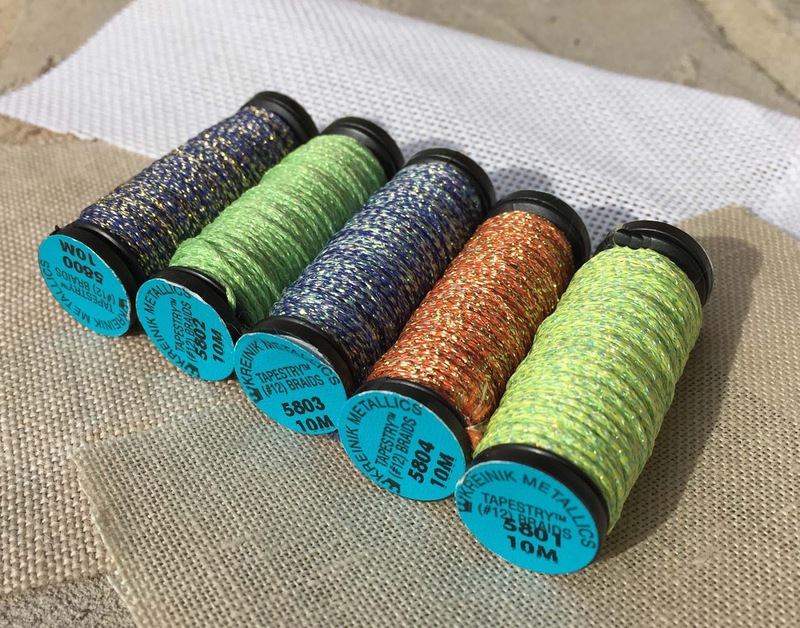 Ok, we can't reveal too much about these fun new shades available in your favorite Kreinik Braids, because they are debuting at the TNNA trade show this week in California (businesses: come to the Kreinik booth! Visit www.tnna.org for show details). Trade show attendees get to see them first. We'll post pictures after the show on our Facebook, Twitter, Pinterest, and Flickr pages. You're going to love the cheerful colors that fill in some shading areas and can be used in many design themes. It may seem strange that Kreinik is coming out with a line of shoelaces, but they are simply a creative, colorful use of your favorite fibers—devoted to a worthwhile cause. The Kreinik family lost their son Charles to suicide last year. These C.A.K.S. shoelaces honor Charles and others in similar situations. A portion of the proceeds go toward suicide prevention, addiction counseling and grief support programs. They are fun, colorful, and cheerful, designed for every day wear or sports/cheerleading groups. Available in two lengths, with metal tips, the first color group glows in the dark. 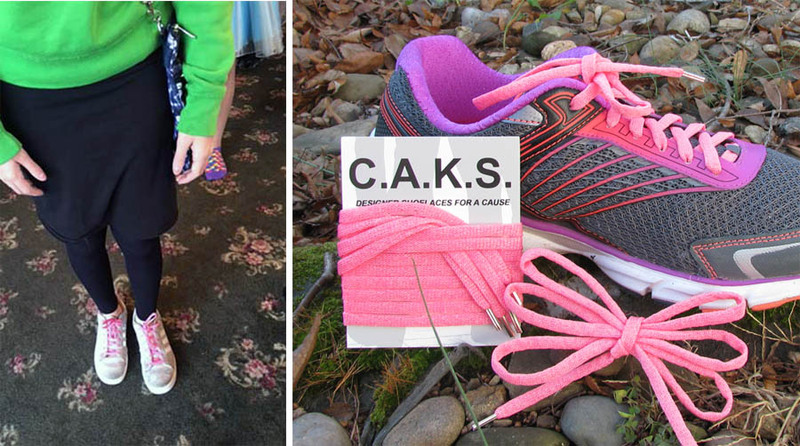 A special custom-lace program has been developed for groups to do fundraising with the laces. Contact us at info@kreinik.com for details. Let's make 2016 a fabulous, fun year. Re-fresh, re-ignite, re-invent, and re-create everything that is good, colorful and creative to brighten lives everywhere. 2. THREAD COLORS: stay tuned!